Brighton will be targeting a return to winning ways when they host Watford at the Amex tomorrow. 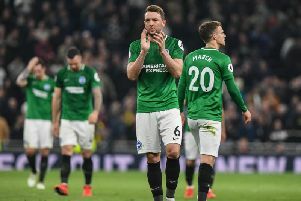 The Seagulls are winless in four Premier League games and have picked up just five points from their last nine league matches. They are 13th in the table and seven points clear of the relegation zone. Watford are ninth after their six-game unbeaten run in all competitions came to an end when they lost 2-1 at Tottenham on Wednesday. Brighton have winger Alireza Jahanbakhsh back available after his return from international duty with Iran at the Asian Cup. Left-back Bernardo could also return after a hamstring injury but winger Jose Izquierdo is still ruled out. Albion boss Chris Hughton is unlikely to make too many changes from Tuesday's 4-2 defeat at Fulham. The Seagulls were outstanding in the first half and led 2-0 at half-time, before Fulham fought back to claim all three points. Winger Anthony Knockaert will be pushing for a return to the starting line-up and the Frenchman could come in for Jurgen Locadia or Solly March. Jahanbakhsh is another option for Hughton but he is more likely to start the FA Cup replay at West Brom next week. Likely line-up: Ryan; Montoya, Duffy, Dunk, Bong; Stephens, Propper, Gross; March, Murray, Locadia. Subs (from): Button, Bruno, Bernardo, Balogun, Burn, Kayal, Bissouma, Knockaert, Jahanbakhsh, Andone, Gyokeres. Striker Troy Deeney and winger Roberto Pereyra, who scored twice in the Hornets' 2-0 win over Brighton on the opening day of the season, are expected to play after picking up slight knocks against Tottenham. Tom Cleverley was subbed just past the hour at Wembley as he started a Premier League game for just the second time in a year. Hornets boss Javi Gracia said a decision will be made on the midfielder for tomorrow's game. Abdoulaye Doucoure, who was linked with Chelsea during the transfer window, is expected to miss out with a knee injury. Asked if he would be available for the game, Gracia said: “I don't think so. Kiko Femenía (hamstring) and Sebastian Prödl (knee) are also out. Likely line-up: Foster; Janmaat, Mariappa, Cathcart, Holebas; Hughes, Sema, Capoue, Pereyra; Deulofeu; Deeney. Subs (from): Gomes, Britos, Cleverley, Success, Masina, Sema, Quina, Wilmot, Chalobah, Gray.